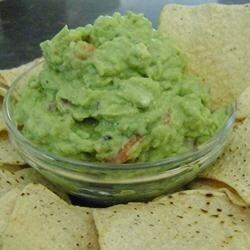 "A chunky, creamy guacamole with just the right amount of zip! Grilled avocados add a smoky, caramelized taste." Preheat an outdoor grill for low heat, and lightly oil grate. Cook the avocados on the preheated grill until just slightly browned and caramelized. Allow to cool to room temperature, then remove the skins, and cube. Place 1/2 cup of the avocado into a mixing bowl, and mash together with the onion, jalapeno pepper, and sour cream. Stir in the lime juice, garlic salt, and hot pepper sauce, then gently fold in the remaining avocado along with the cherry tomatoes and cilantro. Chill 30 minutes before serving. Grilled pineapple is the perfect way to switch up salsa. Made this for the Super Bowl yesterday and it was AWESOME!!! Put the avocados on the grill until they got some brownness and were soft and warm. Very tasty!! I really liked the grilled avocado but did not care for the sour cream. I'll make it again, but this time l will leave out the sour cream and add more hot sauce and garlic. This was awesome. I didn't have all the ingredients so used rotel and a little margarita mix. The grilling made it have such a unique taste. This will be a new staple here.